There is always a story waiting to be uncovered in the U.S. Capitol — not of politics or policy, but of the building itself. 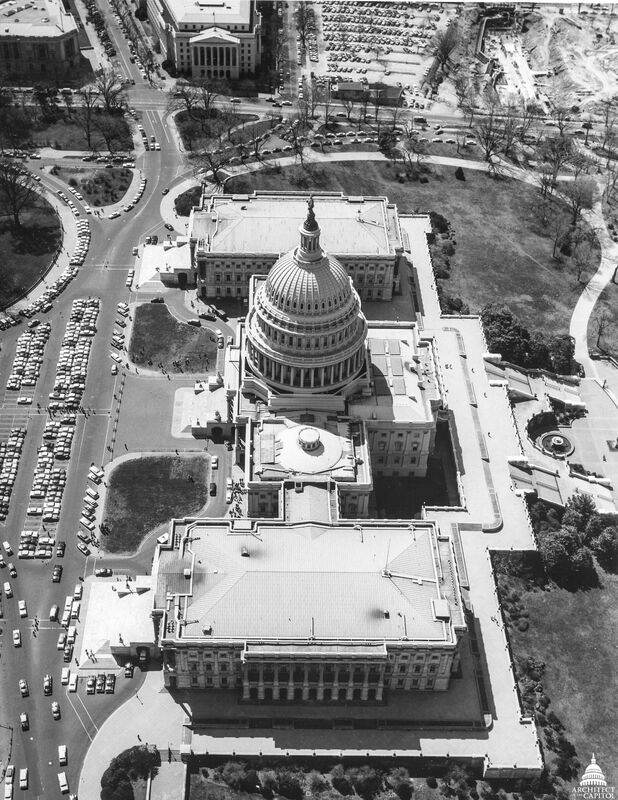 A building of such prominence and formal tradition would seem unlikely to have undergone so many changes over the decades, but our iconic U.S. Capitol continues to change to this day. The building has been topped by two domes and has continued to expand and evolve since George Washington laid the first cornerstone in 1793. The Architect of the Capitol (AOC) has been in charge of most of those projects and, therefore, is the keeper of many records and images that detail the building's long-forgotten features. 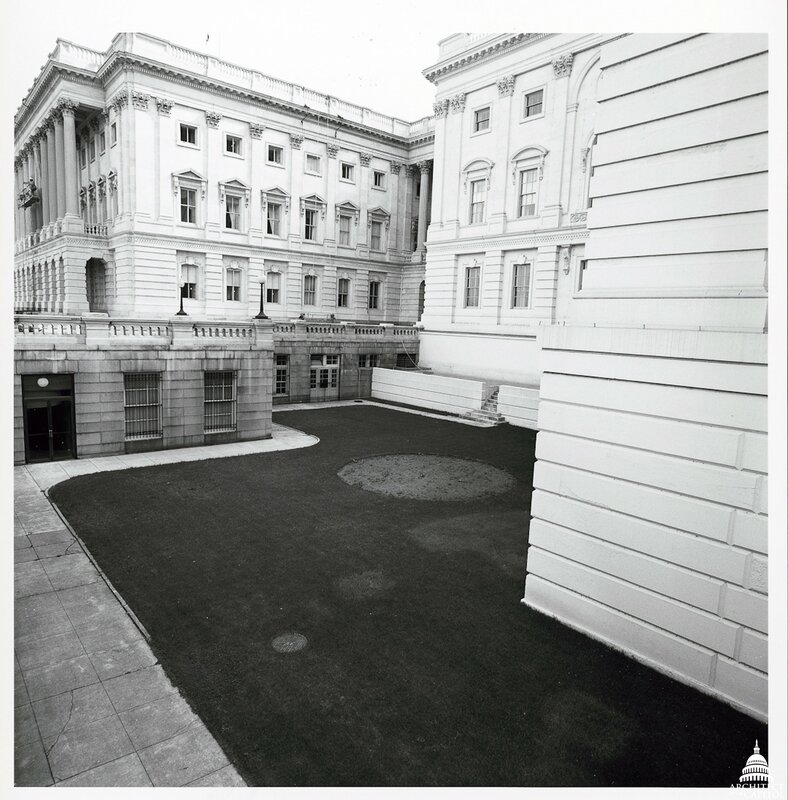 I recently discovered photos of the courtyards that once existed on the U.S. Capitol's West Front. It was the first I had heard of them and — as someone who sits in an office that has no windows to the outside — I wondered what had happened to them. As it turned out, I see the answer every day. 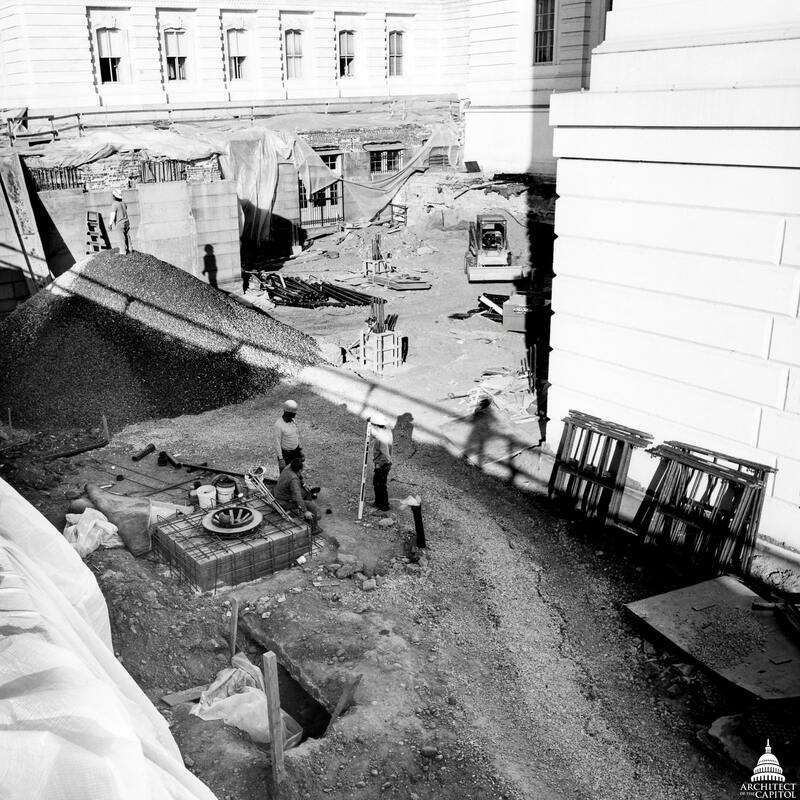 Views of the U.S. Capitol before the courtyards were transformed into meeting rooms, offices and connecting hallways in the building’s basement level. In the 19th century, the courtyards had provided natural light and ventilation to rooms in the basement of the U.S. Capitol. In 1989, modern lighting and air conditioning had reduced the courtyards to little more than storage yards. A 1986 study had determined that the marble Olmsted Terrace of the U.S. Capitol had structural defects. The study identified the need to repair the flat terrace roofs, which leaked and also highlighted the condition of the retaining walls that were out of alignment. The Olmsted Terrace was designed by famed Landscape Architect Frederick Law Olmsted and completed in 1891. Its historical significance was a key element of the terrace restoration and courtyard project. It had been designed as a grand pedestal for the U.S. Capitol, so the project was carefully planned to ensure the additions and modifications were seamlessly incorporated into its design. The construction site as the courtyards were filled in. 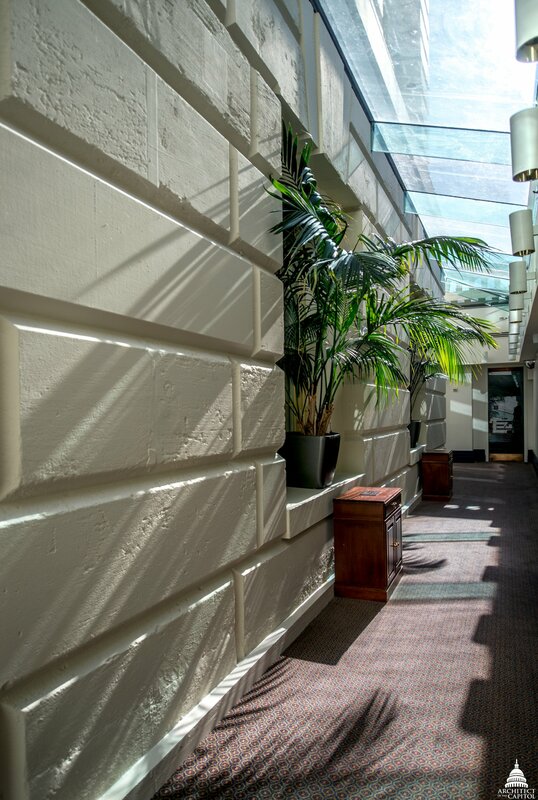 As the need for more space materialized and repairs to the West Front terrace were planned, the idea to transform the courtyards into office space was born. What was once the courtyards is now meeting rooms, offices and connecting hallways in the basement level of the U.S. Capitol — which I, along with many others, use every day. As I began researching our files for this article, I stumbled across a November 1993 article from Progressive Architecture that described how Frederick Law Olmsted's "…original 1885 west terrace was separated from William Thornton's west façade and Charles Bullfinch's central addition by sunken spaces intended as gardens but never planted. 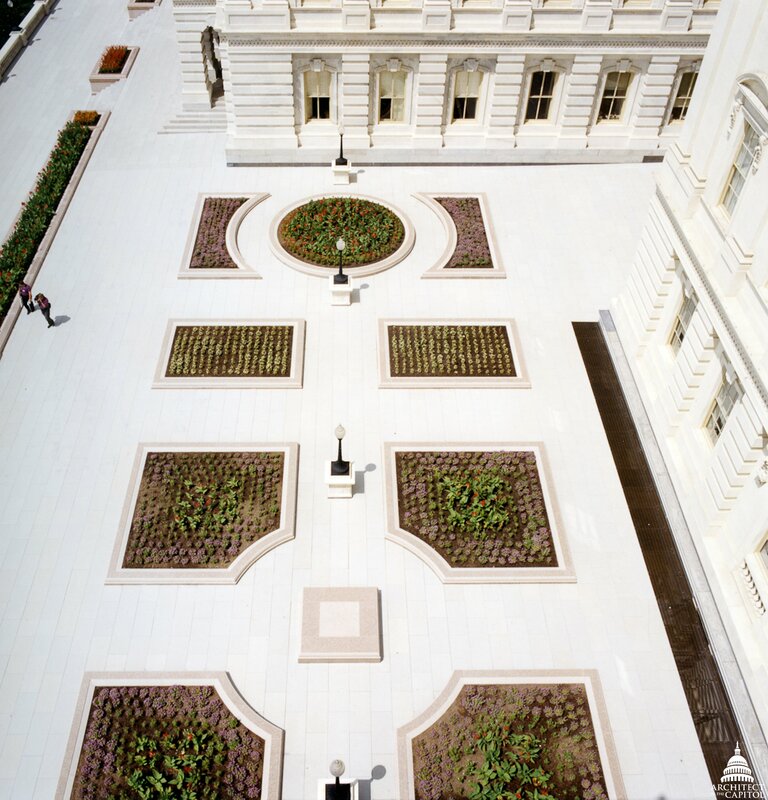 Architect of the Capitol George M. White hired [Hugh Newell] Jacobsen to fill in the wells with office space, to redesign and repave the existing terrace, and to design integrated wheelchair ramps for Thomas U. Walter's north and south façades." 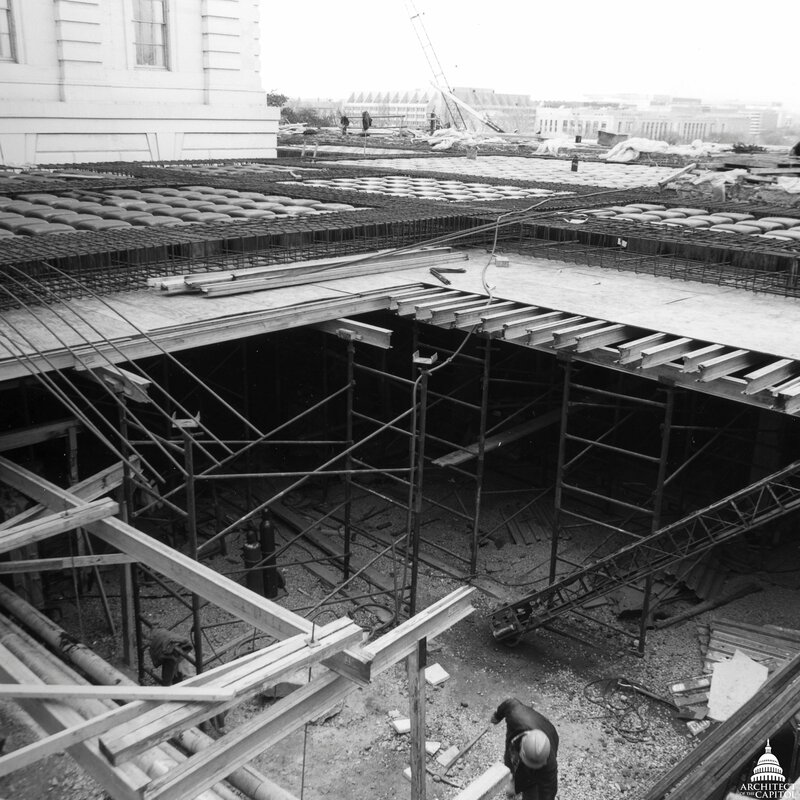 A roof now covers the U.S. Capitol courtyard areas and a skylight allows natural light to fill the hallway once occupied by a courtyard. As an AOC employee, I often hear references to many of those names, but seeing them joined together with their grand achievements in one short, simple paragraph made me pause and marvel at their collective work. Over the course of several decades, these few men created one of the most iconic buildings in the world. For many, it stands today as a symbol of democracy. For AOC employees, it is a constant reminder of the great work before us each day to preserve the past, while seamlessly incorporating the present and planning for the future. Again thank you for history lesson on our capital.